With October’s pumpkins faded, Thanksgiving almost one week past, and the festive holiday month of December beginning tomorrow, I am in need of a reminder that it is still autumn. Everywhere I look right now, I see commercial ads depicting winter wonderlands and happy folks bundled up in heavy winter weather gear. But I’m not ready for the cold, and winter doesn’t officially begin until December 22. That means I still have time to enjoy the scents and colors of autumn and to notice the steady changes leading to winter. I think, “Why rush the season? After all, Old Man Winter will soon enough outlast his welcome.” Don’t get me wrong; I love the first snowflakes of the season, snow days and school closings, icicles on the trees, and bundling up with a cup of hot chocolate in front of a toasty fire. As the song goes, “these are a few of my favorite things.” But all in proper time. And there’ll be plenty of time. For now, I want to make the most of Autumn’s splendor before she gracefully bows out to winter. 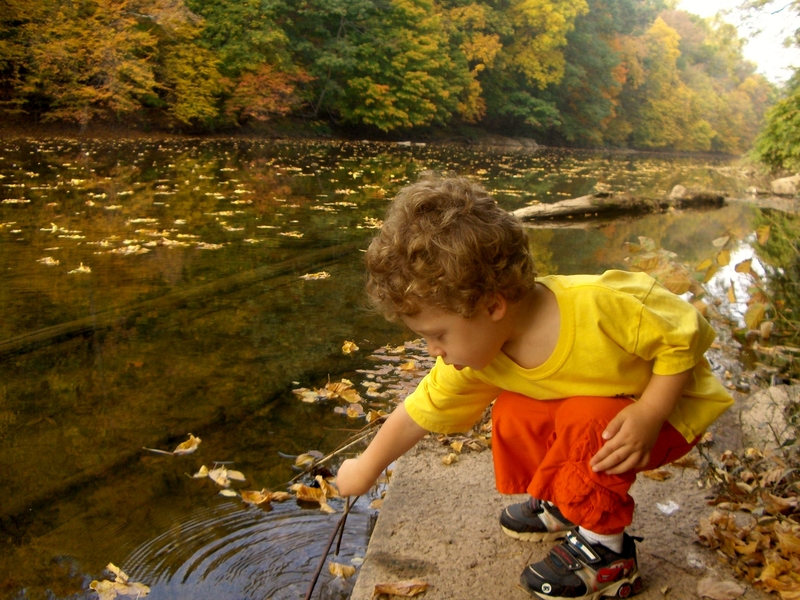 I am reminded of the beauty of autumn when I look at this colorful, serene photo of my nephew Justin playing by the river. Although he’s five now and the photo was taken a couple years ago, to me the image is timeless. The atmosphere is peaceful: leaves floating on the still water and Justin making little concentric waves with the small twig in his hand. At that moment, he doesn’t have a care in the world. The scene is visually rich and stimulating, while the mood is light. The feeling captured is virtual weightlessness; it’s as if time stands still and nothing else matters but being there in that moment. The image is a reminder of nature’s beauty and of spiritual simplicity, and that each season should be appreciated and lived in the moment. I will try to remind myself of that as I approach the often hectic holiday “season”.